We’ve had such nice weather recently in London that I’ve had a chance to roll out the barbecue much earlier in the year than I would normally. It would have been rude not to. Barbecue is a carnal way of cooking, there is something about cooking with fire that fascinates men in the way that making a dainty pavlova never can. Dead animals cooked this way fulfill some deep-seated desire in the males of the species, including me. 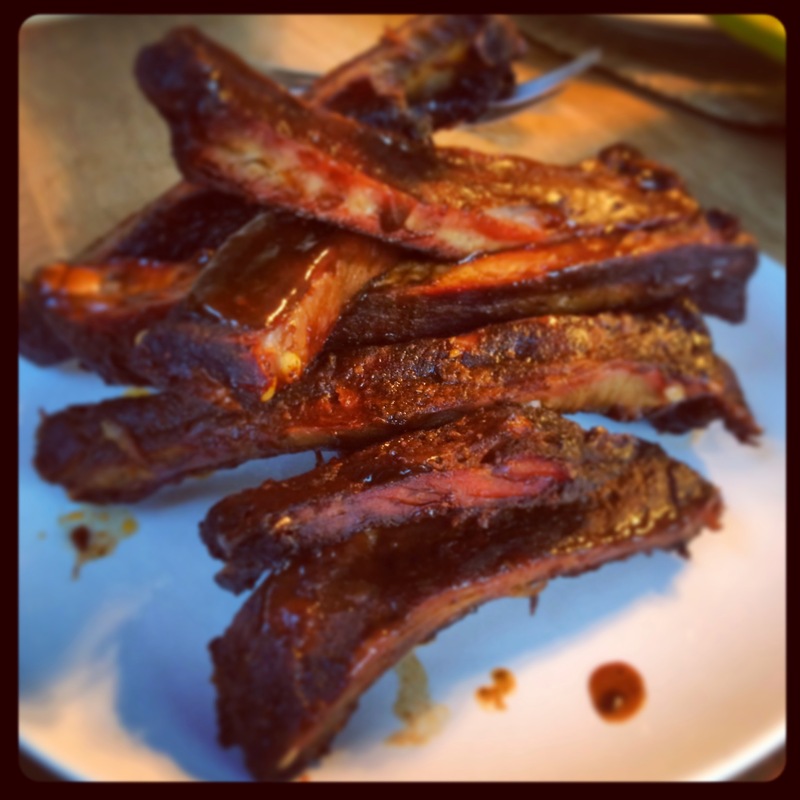 The ultimate barbecue food for that reason has to be ribs. Gnawing at the bone, Flintstone style. It’s not pretty but it is damn tasty. It’s also very good value. 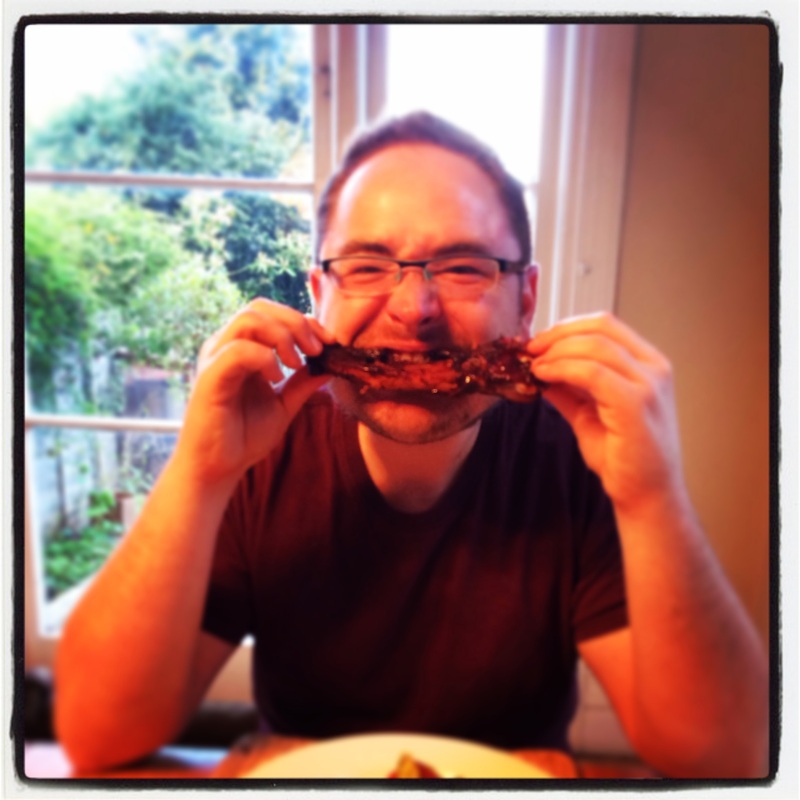 A whole rack of good quality ribs should cost you no more than 6-7 quid from a butcher. I love Britain and generally the British (after all I’m one of them) but it has to be said that in general we are rubbish at barbecue. It has not always been the case. The French called us rosbifs (roast beef) because of our skill at cooking meat over fire, and not as a slur at all. Nowadays the average British barbecue involves nasty sludgy sausages, horsemeat burgers and chicken drumsticks blackened on the outside and raw (or still frozen) in the middle. There is a fundamental lack of understanding as to how to cook food over wood or coals. The Americans are much better, have a wonderful culture of barbecue and we should take note. We have much better raw ingredients in the UK, our cattle is not corn fed (cows shouldn’t eat corn) our lamb is the best in the world, and our pigs also have very high welfare standards (don’t buy Danish pork if you are concerned with welfare.) When you have these wonderful ingredients you don’t need to do much to them. Coal is simply wood that has already been burned in the absence of oxygen; this removes water and also the natural oils in wood. It burns hotter and longer than wood but it is the oils in the wood that provide a true smoky flavor, coating the meat. I use a combination of both when barbecuing for the best of both worlds. Do not chuck a plank of pine on or chipboard, the wood needs to be hardwood. Oak and apple are ideal. Direct heat is the barbecue method we all know. The coals are directly underneath the grill that the meat sits on, this provides searing heat that cooks very quickly. If you are cooking steak, fine, but chicken legs will likely burn on the outside before they are cooked inside. With indirect heat, you position the fuel to one side of the barbecue, for this type of cooking you need a kettle barbecue (Weber is the best known brand) with a lid. You place the meat to one side and, with the lid on you produce an oven. This is where firewood really comes into it’s own. The smoke it produces slowly coats and flavors the meat. With this method you can produce meltingly tender whole joints of pork, beef, whole chicken or really whatever you fancy, even beautiful smoky bread. Both methods have their place and ideally you want a large enough barbecue that you can do a bit of both. One key thing to learn from America is the use of a dry rub. This seasons the meat and helps to form a wonderful crust or ‘bark’. 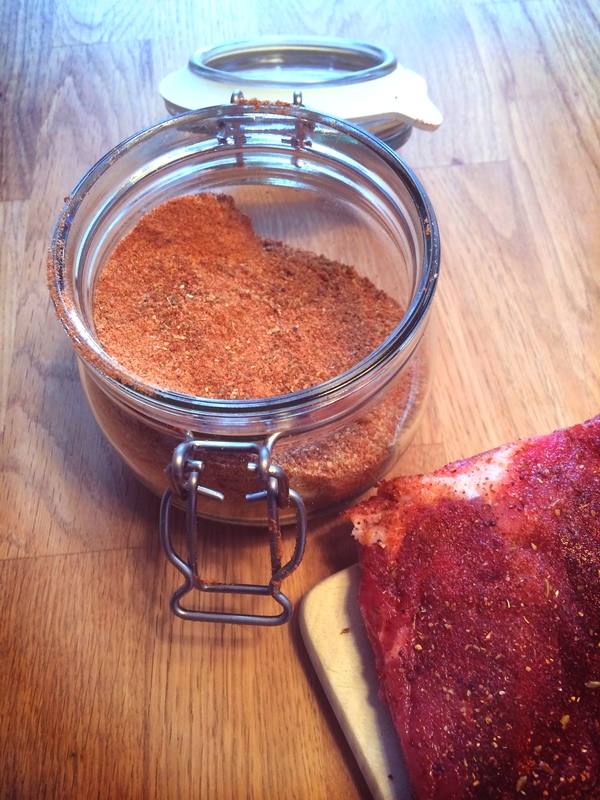 A dry rub should be added either immediately before going on to cook or a good few hours before as it contains salt, see my seasoning meat page for an explanation. A more traditional marinade also work wonders but dry rubs form a better crust. This dry rub is taken from the Pitt Cue cookbook, a fantastic and beautiful book from the soho restaurant, it has the best back cover of any cookbook ever written! Toast the whole spices before grinding and mixing with all of the other ingredients, it will keep for quite some time in an airtight container. It’s a very versatile rub, you can pretty much use it on whatever you like, but I think especially good with pork and chicken. So to the actual ribs finally! There isn’t much of a recipe; it’s just a method. Light the barbecue and set it up for indirect cooking, position the coals to one side. 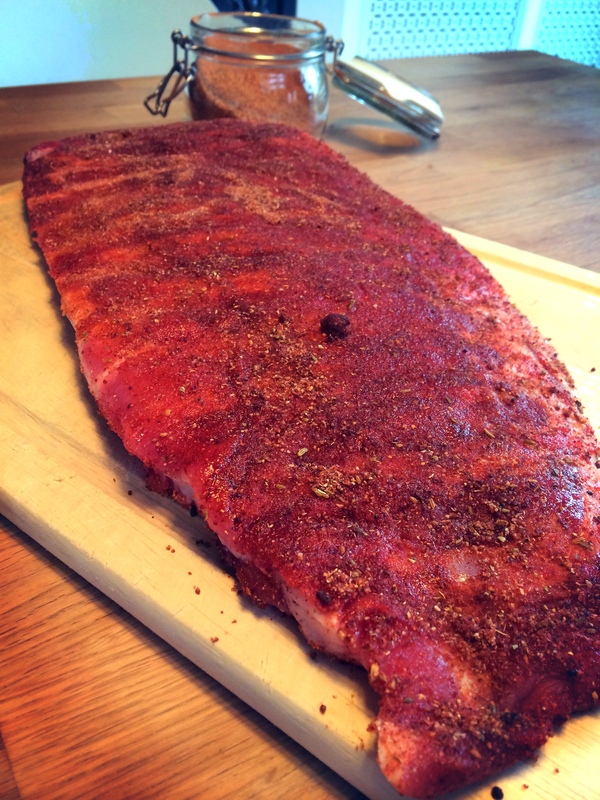 Dust the ribs liberally with dry rub and place them on the grill. 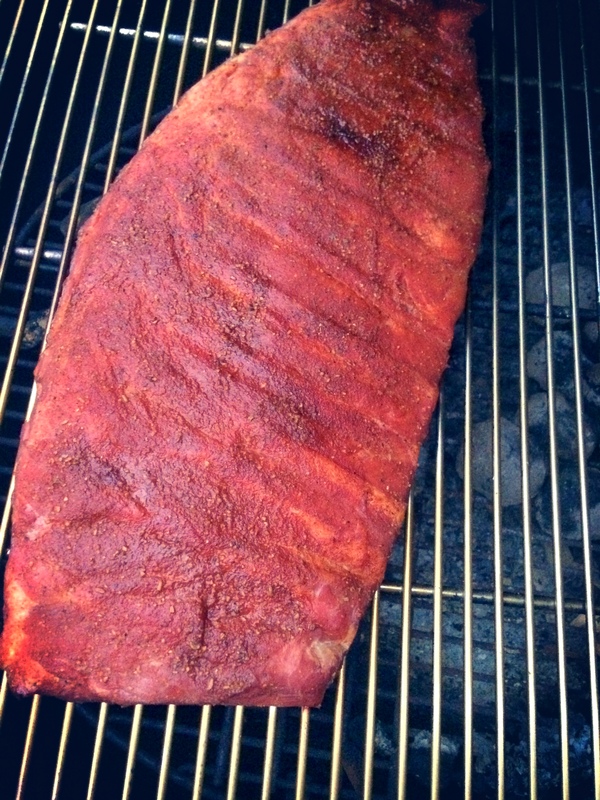 A good hint is to place a tray with water under the grill beneath the ribs. It catches the dripping fat and also keeps the ribs moist as it slowly evaporates. Add a handful of wood chips or a block of wood to the coals and close the lid of the bbq. The ideal temperature to achieve is about 120 degrees and cook for 5-6 hours but barbecue is never precise and you will have to learn by trial and error. We are not looking for meat that is falling off the bone. We just want it nice and succulent. It should have a lovely dark colour from the smoke and the meat feel springy like a medium rare steak. 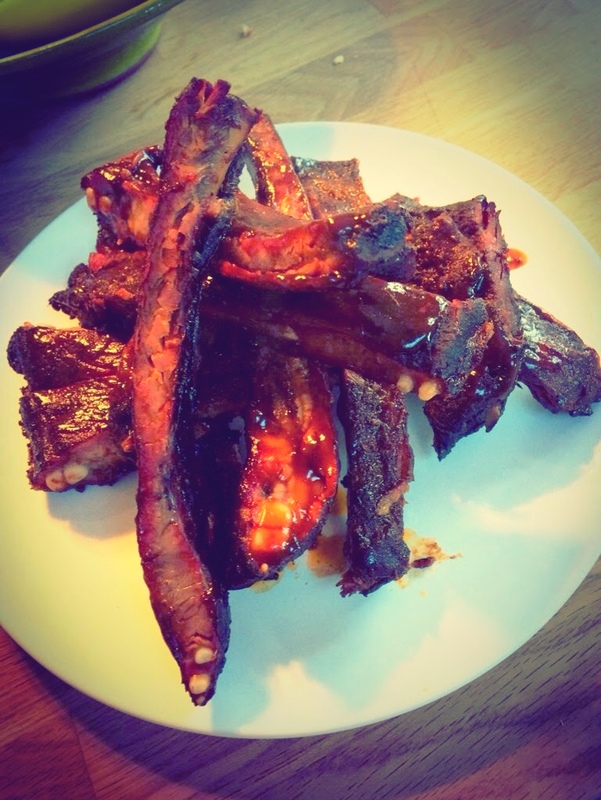 So get this on the go at lunchtime and you should have beautiful ribs for dinner. It will require minimal intervention, you will have to add a few more pieces of charcoal and wood, check on it every hour or so. The ribs when done, will be beautiful as they are (after resting for 15 minutes) or you can baste them in bbq sauce and cook them quickly again under ‘direct heat to really caramelise the outside. This is my quick bbq sauce that I knocked together. It worked very well indeed. Simply chuck into a small saucepan and heat until thick and tangy before basting the ribs.